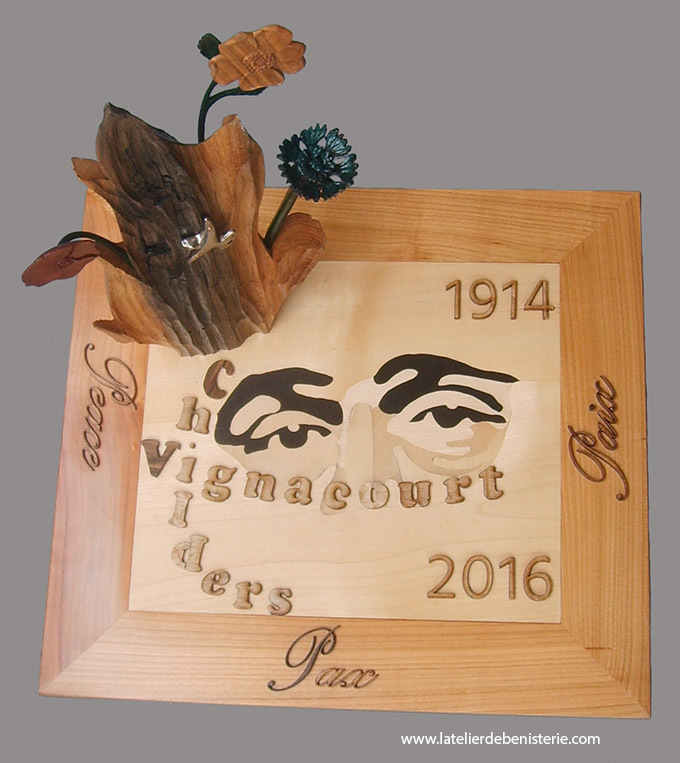 - The poppies have been done in Jarrah wood, it come from a Australian sawmill thanks to Mr Lazarides, to honor the memory of the allied soldiers..
- The cornflower is the emblem of the french soldiers. - The eyes in marquetry are inspired by one Thuillier collection photo. - The flame have been manufactured in oak: this wood come from a tree who has grow up less 2 miles from the wagon where the armistice have been signed. You can see traces of one bomb fragment. - The bird have been created by Father André Marie, with bullet fragments. - The rose is the symbolic flower carved on Vignacourt sideboard, an emblematic piece of furniture from Picardie. An original way to make the family portrait: the marquetry portrait! The colors are produced by the assembly of different types of wood. The realization of the family portrait is a passion in France. Make realize a portrait from an early age allows to immortalize the subject at à given moment. The animals have right to their portrait.